Operation Greens must build forward and backward linkages between farmers and markets. It can learn from Operation Flood. The finance minister announced Operation Greens, on the lines of Operation Flood, with a seed capital of Rs 500 crore in his speech on February 1. Three days later, the Prime Minister backed the scheme at a parivartan rally in Bengaluru. He said farmers are his TOP priority — T is for tomatoes, O for onions, and P for potatoes. Operation Flood changed the face of milk production in India, making the country the largest producer of milk in the world — in 2016-2017, the country produced 164 million metric tonnes (MMT). But it’s important to note that Operation Flood was driven largely by smallholders and the AMUL model has ensured that 75-80 per cent of the price paid by milk consumers goes to the farmers. Operation Greens wants to replicate that success story in fruit and vegetables, starting with tomatoes, onions and potatoes. The main objective of this project, according to the finance ministry, is to reduce price volatility in these commodities, thereby helping farmers augment incomes on a sustainable basis. It also aims to provide these vegetables to consumers at affordable prices. The litmus test of this scheme would be in containing the booms and busts in prices. It will need to avert situations where farmers have been forced to dump potatoes and tomatoes on roads. Also, checking the prices from going through the roof has compelled the government to ban exports. It has resorted to de-stocking and conducted income tax raids on traders — the raids on onion traders in September last year is a case in point. India is the second largest producer of vegetables in the world with about 180 MMT. But China produces four times more vegetables than India. 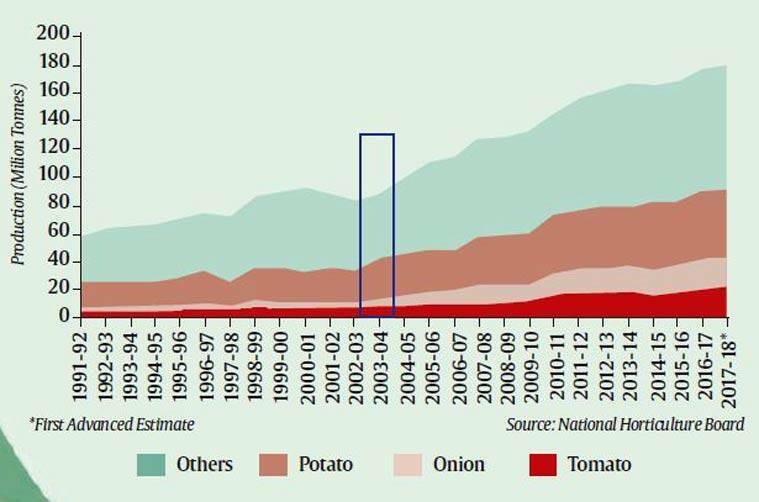 The accompanying graph shows a structural break in India’s vegetable production around 2003-2004. Although not as revolutionary as the Green Revolution in wheat, or the White Revolution in milk, yields of potatoes, onions and tomatoes — which constitute almost half of the country’s vegetable production — have shown a healthy growth. For example, between 2003-2004 and 2017-2018, potato production increased from 28 MMT to 49 MMT while onion yields went up from 6.3 MMT to 21 MMT and tomato production increased from 8.1 MMT to 22 MMT. However, the problem with these commodities is that their prices collapse when their production rises sharply. This is because the country lacks modern storage facilities and the links between processing and organised retailing are very weak. As a result, farmers often end up receiving less than a fourth of what consumers pay in major cities. This must change. Operation Greens needs to ensure that farmers receive at least 60 per cent of what consumers pay. In the case of milk, the producers get more than 75 per cent of what consumers pay. The basic principles of Operation Flood would be useful to operationalise Operation Greens as well. What are these principles? First, link major consumption centres to major production centres with a minimal number of intermediaries. As Verghese Kurien wrote in his book, I too had a Dream, organising farmers and increasing production is an easier job. The real challenge is to find the right markets that can give them remunerative prices on a sustainable basis. So, one needs to map mega consuming centres and link their retail networks with the producing centres of each commodity. Farmers can be organised in farmer producer organisations (FPOs). NABARD and SFAC (Small farmers’ agribusiness consortium) together have about 3,000 FPOs, which could be the starting points for the aggregation of commodities, assaying, sorting, grading, and even packing with bar codes, reflecting their traceability. The Agricultural Produce Market Committee Act will have to be changed to allow direct buying from FPOs, and giving incentives to these organisations, private companies and NGOs to build back end infrastructure as was done in the case of milk. The announcement of tax concessions to FPOs for five years is a welcome step in that direction, if it encourages building such critical infrastructure. Second is the investment in logistics, starting with modern warehouses, that can minimise wastage. An example is of cold storage for onions, where wastage is reduced to less than 10 per cent, compared to the 25-30 per cent wastage in traditional storage facilities on farmers’ fields. Such storage facilities have to be cost effective. A potato cold storage in UP, for example, that buys power at almost Rs 10/kwh from SEBs, can become efficient by generating solar power at less than Rs 4/kwh. Large-scale investments in storage will require tweaking of the Essential Commodities Act. Third is linking the processing industry with organised retailing. On an average, about one-fourth of the produce must be processed. India is way behind on this curve compared to most Southeast Asian countries. Dehydrated onions, tomato puree and potato chips should become cheap, so that an average household can use them. Processing industry adds value and absorbs surpluses. Seen this way, the finance minister’s announcement of increasing the allocation for the food processing industry by 100 per cent is a welcome step. The food processing ministry will have to coordinate with Operation Greens. By developing such forward and backward linkages, the government can ease large price fluctuations, raise farmers’ share in the price paid by the consumer and at the same time, ensure lower prices for the consumers — a win-win situation for all. However, Operation Greens would need a champion to implement this vision and strategy with honesty, another Kurien, for at least three to five years. A babu will not work. Can the government locate another Kurien? 2 Can you hear me? 3 Out of my mind: Where is AAP?